Please deliver flowers on July 12, 2018 between the hours of 10:00 AM to 2:30 PM. Alonzo Roberts was born in Winter Park, Florida, October 29, 1922 to John A. Roberts and Willie (Richardson) Roberts. He was educated in the Orange County school system and attended Winter Park Elementary and Jones High Schools. He served three (3) years in the United States Army. Alonzo Roberts was inducted into the Army on February 7, 1943 at Camp Blanding in Jacksonville, FL. He attended six weeks of Basic Training at Camp Shelby in Mississippi. In his first assignment, Alonzo was a cook assigned to the Camp Shelby Hospital. He served there for approximately 1 year before transferring to the Quartermaster Supply Company whose primary purpose was to provide supplies to other military companies. Thereafter, Alonzo went through 6 weeks of field training before going overseas. He was shipped to the Guadalcanal where he was attached to the Marines for Malaria Control. Alonzo was eventually sent to Cebu, Philippines for 9 months where he continued working to combat Malaria. He was promoted to sergeant while in the Philippines. The bombing of Hiroshima and Nagasaki in 1945 signaled the end of the war. Sgt. Roberts received an Honorable Discharge on February 8, 1946. After his military career ended Alonzo worked in many capacities. Those roles included working for a private family serving as a chauffeur, cook, yardman and house manager. He was also well known as a school bus driver for the Orange County School System. 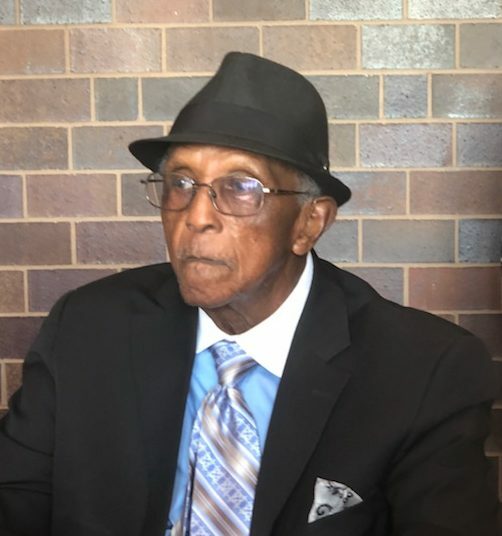 Most notably he was the co-owner and operator of The Deluxe Barber Shop in Historic Hannibal Square where he served dutifully for over 65 years. Alonzo’s passion for barbering was instilled in him by his Uncle, Israel Richardson, Jr. Alonzo completed his apprenticeship under Richardson’s tutelage and credits his successful career to his uncles’ instruction and guidance. Alonzo married Melinese S. Edwards on September 7, 1952. They were married for fifty nine years. They are the proud parents of Kevin Alonzo Roberts, a resident of Fern Park Florida and Mexcye Candis Roberts, an attorney residing in Winter Park, Florida. Sons of Allen Ministry. God gave him the opportunity to sing in the church’s choir one last time before calling him home. He was an Emeritus Member of Ward Chapel’s Board of Trustees. Alonzo lived life to the fullest, grateful to Almighty God for the good things he enjoyed in life. On July 3, 2018, Alonzo “Trick” Roberts was called from labor to reward. He peacefully transitioned from this life at the age of 95. He was preceded in death by his mother, father, brother Howard Roberts, sister Helen Hardy, wife Melinese and daughters Cheryl and Carol Roberts. He leaves precious memories that will be treasured with: Son: Kevin Alonzo Roberts (Fern Park, FL ) and Daughter: Mexcye Roberts (Winter Park, FL); Sister: Mexcye E. Ray (Winter Park, FL); Nephew: Alexander Roberts [Margaret] (Ocoee, FL); Nieces: Alexis Roberts (Tallahassee FL) and Enid Roberts Miller [Cal] (Rochester Hills, MI); Great Neice: Michelle Lewis [Mark] (Winter Garden, FL); Special Cousins: Hattie Miller and Hernandez Miller; Sisters-in-law: Mamie F. Freeman (Winter Park, FL); Geraldine Simmons (Eastman, GA); Brothers-in-law: Leondros Simmons [Hazel] (Eastman GA), Theophilas Simmons [Dora] (Hawkinsville, GA), Curtis Simmons [Mattie] (Hawkinsville, GA); Godchildren: Roxwell and Priscilla Robinson (Apopka, FL), Wesley Robinson (Atlanta, GA), Jason and Amanda Mirach (Chicago, IL), Payton Gardner (Eatonville, FL), nieces, nephews, cousins, two dear and devoted friends Frank Coleman, Charles Chandler and many other loving family members and delightful friends. Heartfelt condolences to you Mexcye from your Legal Aid family. May you find comfort in the abundant memories you have of your father. Many blessings. We have warm thoughts and treasured memories as we remember Mr. Roberts (Trick), getting us to and from Hungerford High School safely for many years. It was also a pleasure meeting and talking with him around town. I will treasure those memories from Winter Park High School days but most of all; Mr. Alonzo (Trick) Roberts will always be loved and never forgotten by us, the Winter Park High School bus riders. I will continue to keep the family in prayer and in my heart during this most difficult time. My deepest sympathy for your lost. Your lost has also become our lost. He was a pioneer in our little community. There is not 1 person that lived on the Westside of Winter Park in the 60’s that will not remember Mr. Trick fondly. I believe that to be true. He gave my son his first haircut and he’s now over 40! His legacy will live on. God Bless the Roberts family.